Yea that’s it, a bigger cart. That’ll do it. Kept reminding myself throughout the weekend up in Glens Falls, NY for the Boys HS State Championship Tournament – that I go through all this for high school basketball. Looking back at the last month or so of just basketball preparation and coverage, I’ve installed full arena strobes at two college gyms for the sectional playoffs here locally and then tackled the almost monstrous task of hauling in all the lighting gear to light up West Point’s Christl Arena last weekend for the two HS State Quarterfinals games. It wasn’t the first time I’d spent 12+ hours in a sports venue – nor will it be the last. While mumbling (I guess you could call it) to myself up in Glens Falls about how working this hard felt like I was back covering NBA games earlier in my career, a younger photographer at courtside said it’s only high school. To which I replied, “No it’s about making the best images possible…”So I guess a sturdier cart will be on the shopping list for next season. I will be embedding a slideshow of the weekend’s work in a bit. Still moving file images and loading a slideshow to the paper’s archive and website. Thanks for looking – stay tuned. ~cg. This entry was posted on Tuesday, March 23rd, 2010 at 12:14 PM. 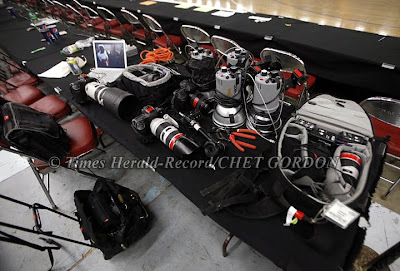 It is filed under Assignments: and tagged with basketball, location lighting, nfa, pocket-wizard, remote, sports, strobe. You can follow any responses to this entry through the RSS 2.0 feed.